You could almost appreciate it as a masterwork of outsider art, if it were not so lethal. Rather, inconveniently, it happens to be right smack dab in the middle of Dave and Annie’s living room. When the latter returns from a business trip, she discovers the former has been lost inside for three days. She and an oddball group of friends discover it is bizarrely cavernous inside, sort of like the Tardis, but with booby traps. 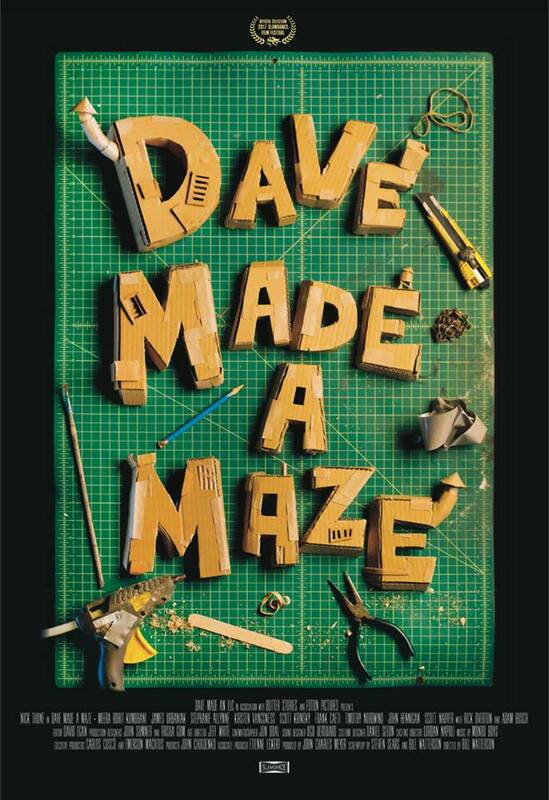 DIY constructionism takes a weirdly fantastical turn in Bill Watterson’s Dave Built a Maze (trailer here), which premiered during the 2017 Slamdance Film Festival. Don’t call it a maze—it’s a labyrinth. Hence, there must be traps and yes, a minotaur. Dave did not create those per se. His cardboard Escher-like construction just took on a life of its own. Much to Annie’s frustration, he will not let her simply cut into it. He has too much pride in his creation. It could also be catastrophically dangerous given the structure’s instability. The exasperated Annie calls in his friend Gordon as back-up. Unfortunately, the scene soon turns into a circus. Eventually, she just heads into its cave like entrance, with whoever cares to tag along. However, things get real in a hurry when several of their more expendable friends are quickly killed off. It is hard to fairly convey a sense of the film’s tone. You would never call it cutesy or quirky, nor is it dark or moody. One might start with Michel Gondry and Edgar Wright as reference points, but they are still not quite right. Regardless, Maze is wildly inventive and slyly funny, featuring some absolutely incredible cardboard set designs. Production designers Trisha Gum and John Sumner, along with art director Jeff White deserve standing ovations for what they have realized (presumably on a not-so extravagant budget). There is also plenty of snappy, archly sarcastic dialogue, delivered with pitch-perfect aplomb by Adam Busch and James Urbaniuk (a.k.a. Ned Rifle), as Gordon and Harry the aspiring documentarian, respectively. Nick Thune’s titular Dave is necessarily a bit off a sad sack, but Meera Rohit Kumbhani’s Annie just lights up the screen with her smart, grounded, star-making presence. Frankly, it is kind of shocking how well Maze works. There is nothing twee about it, especially not the tripped-out animated sequences. It is all kind of nuts, but it adheres to its own system of illogic. Very highly recommended for cult film fans, Dave Made a Maze screens again tomorrow (1/23), as part of this year’s Slamdance in Park City.